No one has picked up on the bigSTORY concepts faster than Ron Finley, known around the world as The Gangsta Gardener, a leader in the urban gardening and food justice movements. We put one of our concepts, ‘Levels of Meaning,’ to good use in his rehearsals and story analysis for his 2013 TED Talk, which has been viewed at least 3 million times. As his neighbor and friend, we can tell you that his garden is an oasis in our community–a place where people come from near and far to get their hands dirty, and, as he says, “change the community by changing the composition of the soil.” We’ve staged bigSTORY workshops in the abandoned swimming pool that serves as his plant nursery. We’ve had lots of business meetings in his garden. Ron was a guest speaker at our 2015 bigSTORY Conference. He helped us plant the box gardens in our backyard, as he has helped with hundreds of other gardens in our part of L.A.
Ron and his assistant, Ashleigh Carter, have been working around the clock to save the Gangsta Garden from a land speculator called Strategic Acquisitions. Ron had to raise half a million dollars in less than a month to avoid eviction. With help from friends like Bette Midler, John Foraker the CEO of Annie’s Homegrown, Nell Newman, the CEO of Newman’s Own, and companies like General Mills–all of whom donated five- and six-figure sums– along with thousands of smaller donations, he did it! Ron raised the half a mil. It is in the hands of the lawyers now, and we hope Strategic Acquisitions recognizes that what Ron has built cannot be replaced by condos, and honors the commitment they made earlier to let him buy back the property. 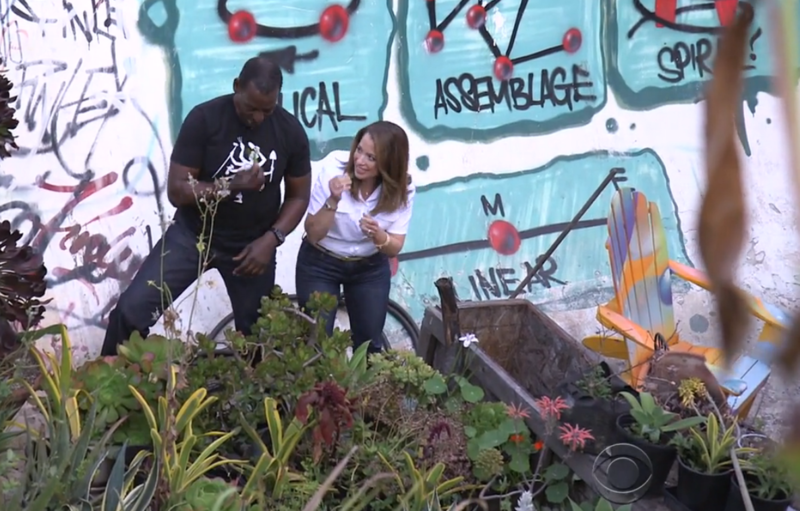 Last night, the CBS Evening News ran a story about Ron and the Gangsta Garden. bigSTORY gets a bit of play in it, too. The graffiti in the background of the interview the CBS reporter, Mireya Villareal, did with Ron was painted by his son, Del, who’s an amazing artist, as part of a bigSTORY workshop. It depicts what we call story formations. The formation Ron used to raise the half a million dollars is an ‘Assemblage’ narrative, whose structure resembles, fittingly enough, a rhizome plant, putting down shoots and roots, and making underground connections, until a field is filled. In this, the spring of a superbloom in the California deserts, it is completely in sync with nature to see Ron’s garden blooming anew in the food desert of South Central L.A.
Ron’s son, Delfin, writing the bigSTORY formations for a workshop we did in the Gangsta Garden.